The Deep Imact probe will be impacting over night tonight. Imact is set to happen at 1:52 AM (Eastern Daylight Time, 12:52 AM Central Daylight Time). The impactor successfully separated last night (2:07 AM Eastern Daylight Time Sunday morning). The Discovery Institute has rented out a hall at the Smithsonian to screen a new film that supports Intelligent Design. Yup. And yet, I could not rent out the Albert Einstein Planetarium at the Air and Space Museum for my non-religious wedding. that is? Perhaps because their brand of “science” is not science at all. I received a question through Ask a High Energy Astronomer with such attitude that I wanted to slap the author. 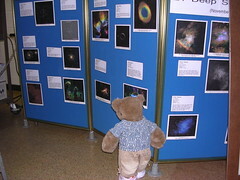 She said that she had asked an “Ask an Astronomer” service at NASA when she was a lot younger if dark matter could be made up of tachyons, and was disappointed when the answer was basically “no”. Luckily, she says, this answer didn’t dissuade her from pursuing physics. Now, as a 4th year physics student, she’s dug up a paper (“Quasars as bubbles of dark matter: evidence for axion and tachyon matter in the Universe“) that says that tachyons are a dark matter candidate, so she asks us again if dark matter could be tachyons. Hopefully anyone reading this blog already knows that buying star names is a total crock. However, I thought I’d share this FAQ from the IAU on Naming Stars. The IAU (International Astronomical Union) is the organization that assigns names (or designations) to celestial bodies and the features on them, and their names are the ones that are recognized internationally. They don’t sell star names. If they don’t sell star names, then anyone else you might send money to for a star name is just BS. I love the weeks I spend answering questions for Ask a High Energy Astronomer (soon to be just “Ask an Astronomer”). Why? In part because I get to enlighten people who are curious about astronomy, but mostly because of the websites I run across while searching for resources to pass on in my answers. Usually I come across crackpot science webpages (and today is no exception, see below), but today I also discovered a cool page, No Answers in Genesis. NAiG is a site devoted to pointing out the inaccuracies and inanities present in the creationist dogma. Much of the site is devoted to evolution and Darwinism, but there are a few things about cosmology and the origin of the Universe. In the same web search, I also found a crackpot site, TruthBook.com. This site contains the text of The Urantia Book, which is a book containing “religion, history, science, and philosophy, and includes the life and teachings of Jesus.” The authors of this book? Your sun is now passing out of its six billionth year. At the present time it is functioning through the period of greatest economy. It will shine on as of present efficiency for more than twenty-five billion years. Really? 25 billion more years? Five times more than the currently accepted estimate, based on solid science? But then, this comes down from superhuman, celestial beings, so it must be true. That’s right, it’s gravity that keeps light from escaping from stars, not the incredible density of the central regions. I suppose that means that black holes are just larger suns that have run out of X-rays? And, of course, X-rays are separate from light, right? Here’s a cute Interview with Sol by Robert J. Nemiroff (from 1987, so a bit old, but the information is still good). AM: When did you decide to have planets? Sol: Very early in life, although I’m not exactly sure when – that part of my life was very nebulous. I didn’t really plan to have planets because I never had a steady companion. They just sort of spun off of my care-free early life style. Cosmologists and Religion in Cahoots? Last time I was on the Ask a High Energy Astronomer hotseat, I stumbled across this article: The “Big Bang” is Just Religion Disguised as Science [The article moved or is gone – Jan 2014]. Wow. Fortunately, the article is difficult to find if you go straight to the What Really Happened page, but there you’ll find some other wacked-out theories (I’m assuming, based on the headlines — I didn’t actually read through anything). This particular article starts out with a long introduction about how the geocentric model of the Universe was based on religion, and how later generations clung to the model because it served the agenda of the Church. Okay. A bit clunky, and rambling, but not entirely inaccurate. Religious circles embraced the idea of an expanding universe because for the universe to be expanding, then at some point in the past it had to originate from a single point, called the “Big Bang”. The “Big Bang” coincided nicely with religious doctrine and just as had been the case with epicycles (and despite the embarrassment thereof) religious institutions sought to encourage this new model of the universe over all others, including the then prevalent “steady state” theory. Huh? I’m not sure which religion the author is from, but most of the ones I’m familiar with (namely, the Protestant Christian ones) hate the idea of the Big Bang. They contend that the Universe cannot be as old as Big Bang cosmology indicates, and blast anyone who dares promote the Big Bang. The debate has not yet reached the level of the evolution controversy, but it’s just a matter of time. An attempt was made to prove the Big Bang by searching for the “Cosmic Background Radiation”, the presumed energy echo from the primordial explosion. and indeed a radio noise signal was picked up. Yes, the CMB (cosmic microwave background) is viewed as a large piece of evidence supporting the Big Bang theory. However, the CMB was discovered more by accident than as a search for evidence to back up the BB. But just as the theory of epicycles did not accurately predict the observed motion of the planets, the Big Bang Theory turned out to be less than accurate about the radiation signal detected in space. When the satellite COBE was sent up to analyze the Cosmic Background Radiation, it discovered instead of the smooth featureless glow predicted by the cosmologists a highly complex and detailed structure. Actually when the first COBE results were posted, the astronomers were impressed by how smooth the results were, but were also a bit worried that it was too smooth. After longer exposures, COBE finally showed the complexities in structure that had, indeed, been expected. The article finally gets to the point it wants to make. It presents the theory that the redshifts observed for distant galaxies can be caused by the remnant of a nearby supernova — that there is an old remnant of a planetary nebula Earth is sitting in. We’re made of heavy elements — Okay, that’s right, but they came from generations of stars successively enriching the interstellar medium. But, we are, in fact, sitting in the “Local Bubble”, which is likely due to an ancient, relatively nearby supernova. But, there’s no evidence of a remnant planetary nebula, and astronomers have known about this “Local Bubble” for a while now. Um..that seems to be it. The author seems to want to “shame” astronomers into considering his theory because apparently we’re clinging to a “religious view” of the Universe. I’m sorry to inform him that it’s not going to work that way. For astronomers to reexamine a well-established (and well-supported, for that matter) theory, there needs to be compelling new evidence that has been well-tested (and well-established). The first response to the initial evidence for “dark energy” was skepticism. Since then, there have been numerous studies that have confirmed the original results — only then did astronomers and cosmologists start to reformulate their view of the Universe. Perhaps the greatest advantage of observing from a place that has no atmosphere is being able to observe every conceivable wavelength of electromagnetic radiation equally well. Significant amounts of visible light waves and radio waves are able to pass completely through Earth’s atmosphere, but very little else can. From the Moon, or from space, the same telescope could be equipped to detect gamma rays, X-rays, ultraviolet, visible, infrared, and radio. From the surface of the Earth, a telescope is mostly limited to observing visible and radio wavelengths. While the main emphasis of the answer is correct — since Earth’s atmosphere absorbs certain wavelengths, if we put a telescope where there is little/no atmosphere, we can observe all wavelengths — the statement that any given telescope could be equipped to observe any wavelength is absolutely misleading. So, while it would absolutely be possible to observe all wavelengths from the Moon’s surface, due to its lack of atmosphere, it is not possible to use the same telescope to observe all of those wavelengths. Well, Pluto is actually as old as our Solar Systemr, but the official announcement of the discovery of Pluto by Clyde Tombaugh was made 75 years ago today, on March 13, 1930. Space.com has an article about Pluto and its discovery. Pluto is the planet we know the least about, partly because it is the most distant planet (at least most of the time) and the smallest. It is also the only planet that has not had a spacecraft fly-by. Hopefully that will change in the next few years. NASA‘s New Horizon’s Pluto-Kuiper Belt Mission is scheduled to launch in January 2006, and will arrive at Pluto sometime in 2010 after a 2007 fly-by of Jupiter for a gravity-assist. 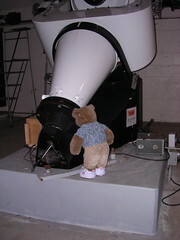 I gave the talk last night at the UMD Observatory, titled X-ray Astronomy: Frequently Asked Questions. The forecast called for snow and icy conditions, which probably kept a lot of people from the observatory. The group was small — about ten people were there for the talk. I had planned for several children to be in the audience, and feared that with only the one there, my talk might be at too low a level. However, at the end, three people asked questions, which suggests that it was at an accessible level. Overall a good experience for me, and hopefully for the attendees as well. Felicia came with, and gave her talk, too, as shown in the picture below.